The Dutch company Niverplast is one of the world's largest manufacturers of machines for inspecting bakery products. These machines are supplied all over the world and use image processing technology from STEMMER IMAGING for the reliable detection of faulty loaves of bread and bread rolls. See what it takes to deliver only perfect bread to your customers - size and form of the bakery doesn't matter thanks to the easy and flexible software from Niverplast. And a thorough inspection is guaranteed because of the high quality machine vision components provided by STEMMER IMAGING. It all began with plastic bags: Niverplast was founded in Rijssen in 1986 and initially sold plastic bags, such as those frequently offered in supermarkets for carrying home one's purchases. That soon became too little for the Dutch, however, and machines followed that could automatically open such bags, machines that could place the bags in cartons or erect cartons, and devices for welding and folding plastics. Today, Niverplast's core competence is the manufacture of complete systems with which objects can be inspected, counted and packed. Apart from plants for meat, fish, oils and greases as well as other products for the non-food segment, the company specialises in the field of bakery products. Niverplast only entered the field of bakery products in 2009, but has grown in the short time since then into one of the world's largest manufacturers of such systems. "About 80 percent of our plants are conceived for industrial-size bakeries and are used all over the world", says Albert Danneberg from the Niverplast R&D team. Danneberg describes the basic process of such a system for inspecting and counting bakery products as follows: "The pre-baked loaves or rolls can be fed to the machine in two different ways, depending on the user's wishes: we either develop an automated supply direct from the deep freezer, or the frozen dough products are manually placed on the conveyor belt. Before the products enter the machine, a metal detector first of all checks whether undesired metal parts have got into the bakery products in the preceding processes." Image processing systems play the decisive part in the steps that follow: At the first station a quality inspection takes place in which the geometrical dimensions such as the length, width and height of the bakery products are measured and analysed. In addition, the machine recognises at this point whether there are any breakage errors or, for example, whether features like browning, topping or roundness of the bakery product is correct. 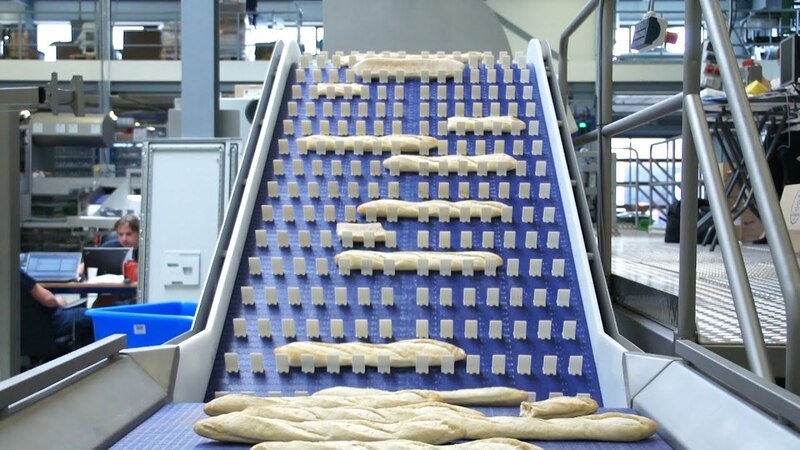 After this first station, faulty products are separated out fully automatically via dynamic conveyor belts before the positively evaluated bakery products are counted at the second station. "We offer this first test cell for quality inspection as an option, but most customers order their system with both cells", says Danneberg. Subsequently, the bakery products are packed in the desired quantity according to the customer's specifications, e.g. in cartons or bags. In the system described, the customer wanted to pack the inspected bakery products in certain quantities in bags placed in cartons. Two separately controllable belts are used here for the transport of the empty and full cartons. The essential core element of the two test cells is the image processing, for which Niverplast relies fully on its long-standing partner STEMMER IMAGING. Dietmar Serbée, managing director of the Benelux branch office of STEMMER IMAGING, well remembers the start of the cooperation with Niverplast: "Initially the requirement was only to count the bakery products; the detection of errors was added later. Niverplast had already approached several other image processing companies in search of solutions, but in the end they decided to choose STEMMER IMAGING as their machine vision partner." According to Serbée, the particular difficulty with the task was that no two loaves of bread are alike: "The shapes of the pre-baked loaves of bread and bread rolls are never identical. They are always slightly different. It is very difficult for an automated system to decide, for example, whether a depression in the surface of a baguette is a deliberate cut or the start of an undesired breakage." Following an intensive development phase, Serbée was able with a proprietary software solution based on the image processing library Common Vision Blox to reliably distinguish between such features. Serbée also selected the necessary hardware components for the image processing system. "In the preliminary investigations we carried out tests to determine which camera, lens and illumination could achieve optimum results. In the end we chose a combination of line scan cameras and the matching line scan illumination and lenses. With those we can optimally cover the conveyor belts, which are up to 1300 mm wide." Apart from the delivery of a few further components such as the PC systems and various cables, STEMMER IMAGING also took care of the connection of the imaging software to the graphical user interface of the system, via which amongst other things the programs for the next batch of bakery products are adjusted. "The GUI itself was made by Niverplast. We cooperated closely on the connection in order to fully satisfy our customer's wishes", Serbée remembers. System overview: The bakery products arrive at the left end of the machine and pass two test stations before they get packed into cardboard boxes at the right end. The frozen bakery products are supplied to the plant via a conveyor belt. A metal detector checks the baked goods against possible metal parts at the beginning of the process. Depending on the width of the conveyor belt, one or two lines scan cameras are used. The setup for the next bakery products is made via a touch panel at the machine. The largest system that Niverplast has developed and delivered so far encompasses two parallel lines, each with test cells based on image processing for the quality inspection and counting of bakery products. Despite the very good order book situation, the developers at Niverplast have further ideas that will be incorporated into the design of future systems. Danneberg reveals one of these ideas: "The height of bakery products can be measured using a multiple 3D triangulation system. Loaves of bread and bread rolls can thus be measured even more accurately and defects in the bakery products can be recognised more reliably, therefore we will be offering this possibility as a further option for our systems." Niverplast develops innovative packaging solutions to protect and transport a wide range of products. Bread, meat, fish, liquids and non-food products that have to be packed in a bag and box are the core business of the Dutch company, whose systems are in use on every continent in the world.